Maserati will display two of its latest models at the London Boat Show which runs at EXCEL London between January 8th and 17th 2010 thanks to its partnership with Ventura UK Limited, the official importer for Ferretti Group in the UK. 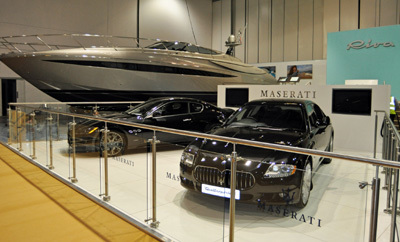 A Maserati Quattroporte S and a GranTurismo S in Nero Carbonio (carbon black) will be displayed alongside a Riva Aquariva Super and a Riva Rivale, offering the London Boat Show visitors the chance to appreciate the two companies’ common traits: strong heritage, Italian roots but international appeal, unmistakable style, timeless elegance and unique craftsmanship combined with state-of-the-art quality and the latest technologies. The Maserati Quattroporte S, the latest incarnation of Maserati’s iconic flagship saloon, has a dual soul as a luxury saloon with sports-car performance and is fully responsive in all driving conditions whilst cosseting the driver in its luxurious and distinctive ‘Made in Italy’ interior. It’s equipped with a 4.7 litre V8 delivering a maximum power output of 430 hp, accelerates from 0 to 62 mph in 5.4 seconds and has a maximum speed of 174 mph. The Maserati GranTurismo S is the ultimate expression of the Trident’s sportiness. Its 440 HP V8 4.7 litre engine, electro-actuated gearbox with fast MC Shift, transaxle layout, sporty exhaust and dual-cast brakes make the GranTurismo S a true ambassador for Maserati’s sporting flair, with acceleration from 0 to 62 mph in 4.9 seconds and a maximum speed of 183 mph, the highest ever reached by a standard production Maserati. 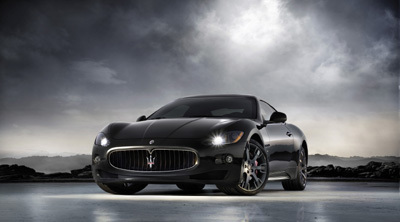 Prices for the Maserati Quattroporte S start from £85,005 whilst the GranTurismo S is on sale at £89,910.